After years of relying almost exclusively on Jeffrey P. Bezos’s fortune, Blue Origin now has a paying customer that will bring in a precious resource that has been scarce in the company’s 17-year existence: revenue. The deal marks a significant milestone in the growth of the company, which for years had remained obsessively secretive. Bezos has said he has poured more than $500 million of his own money into it — but has received relatively little outside revenue. But recently Blue Origin has stepped into the spotlight — as a sponsor of the satellite conference, its banners and logos are all over the Walter E. Washington Convention Center — and it is starting to accelerate its activities. It is working to revamp a launch complex at Cape Canaveral Air Force Station, while also building a massive rocket manufacturing facility nearby. Blue Origin’s entrance into the commercial satellite market would put it in competition with Elon Musk’s SpaceX, which has been flying satellites for commercial companies for years. “I think this is a sign that the industry has actually got some legs that both of these companies are going to be moving forward,” said Todd Harrison, an analyst at the Center for Strategic and International Studies. The mission to launch Eutelsat’s satellite to geostationary orbit would come in 2021 or 2022. 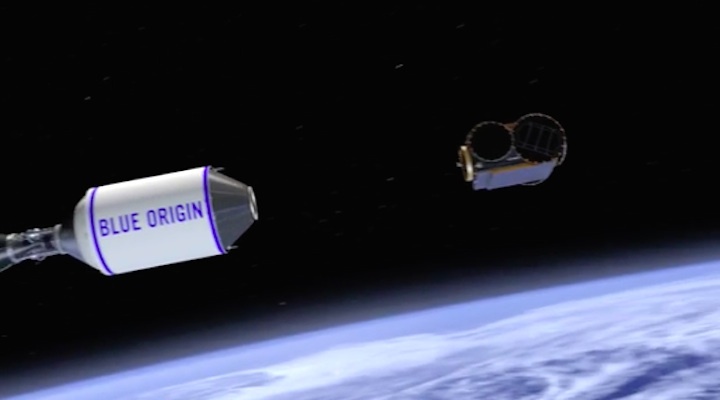 Scott Pace, the director of the Space Policy Institute at George Washington University, noted that Blue Origin probably would also be competing against Arianespace, a French launch company. “While there is a significant risk in using a new vehicle, satellite operators have shown that they want a diverse range of suppliers and not be tied to just one or two launch providers. Thus they will practice 'strategic sourcing' to ensure competitive alternatives,” Pace said. During a 23-minute question-and-answer session Tuesday, Bezos offered some new details about New Glenn, named after the late John Glenn, the first American to orbit Earth. The rocket’s first stage, or booster, is designed to be reusable. Once it delivers its payload to orbit, it would then fly back to Earth, landing on a ship at sea — a feat that SpaceX has been performing for about a year. Blue Origin has also pitched NASA on a public-private partnership to fly cargo and science experiments to the surface of the moon, a mission it has dubbed Blue Moon. This year, it plans to begin crewed test flights of its suborbital New Shepard rocket. By next year, it could start flying paying tourists on trips that would cross the 62-mile barrier that’s considered the edge of space. 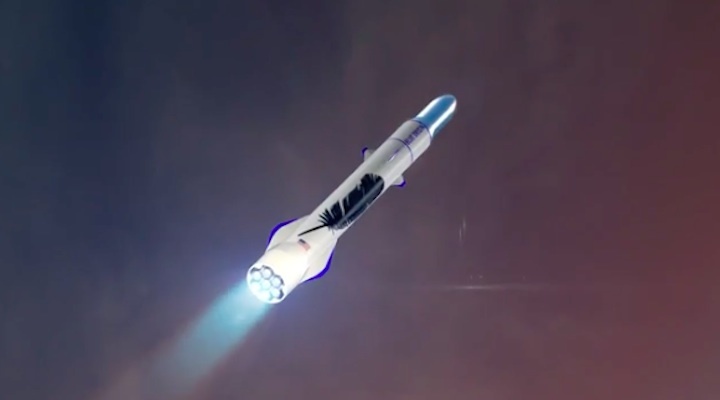 Blue Origin Founder and CEO Jeff Bezos presented more details about his company’s New Glenn orbital launch rocket and vehicle system on Tuesday morning, which will be used for the company’s first satellite launch around the 2021 timeframe. And the new vision for the rocket seems to be taking cues from rival SpaceX — specifically the whole landing-a-rocket-on-a-droneship thing. Blue Origin, Bezos announced at the 2017 SATELLITE Conference and Exhibitionin Washington, D.C., just inked its first-ever contract with a customer: Eutelsat Communications SA. Communications satellites are commonly placed into higher orbital regions above the planet’s surface. Unlike the suborbital New Shepard system, New Glenn will have the capability of going to those higher-up altitudes. But like its predecessor, New Glenn will comprise of a reusable booster that will fly back to Earth and land upright. And here’s where Blue Origin has probably watched SpaceX own rocket landings with a keen eye. SpaceX has made a name for itself landing rocket after rocket after rocket. Many of those boosters have come back to Earth and landed on droneships in the ocean— which is necessary for missions that go higher up into space, because it’s more difficult to land a booster on a specific patch of land when it has to return from a higher altitude. By presenting a droneship as part of its future plans for New Glenn, Blue Origin is basically further solidifying the perception of a rivalry between it and SpaceX — whether intentionally or not. Blue Origin claimed the mantle for the first booster landing, but it was SpaceX who succeeded in bringing a rocket back from orbitalspace — and then repeated the same feat later with a droneship landing. It’s going to be interesting to see whether Blue Origin’s first droneship landing inspires another Twitter beef between Bezos and Elon Musk. Keep the popcorn handy in a few years.